The courage to be responsible for someone’s life and happiness again is something I lack in a big way. In the end, being responsible for someone else’s life and happiness is what a real relationship is all about. Being with the one special person you want feels great… most of the time. However, if something goes wrong, it can be decimating for both people. Once you cross the relationship line, both people possess the power to destroy each other. I know what it’s like to be bulldozed by love. I can’t risk it again. But did I already cross the line by kissing her the way I did? Because she’s all I think about, all I see when I close my eyes. I don’t get this. I thought I loved Abbey with all my heart. I thought we would be together for the rest of our lives. I guess we were. I just didn’t know the rest of Abbey’s life would be so short. But if all those emotions for Abbey were real, how can I be feeling what I’m feeling for Trace now? She’s so different than Abbey. I’m consumed by the guilty feeling that if Abbey had lived, in time I might’ve fallen out of love with her and destroyed her in a different way. We were both young. I’m not exactly ancient now, but three or four years in time and experience in college can make a world of difference. I’m a different guy than I was when I was a freshman, learned a lot about life and love. That doesn’t mean I know for sure what the future holds and I don’t want to do anything to Trace to hurt her somewhere down the road. She deserves way better than me. See what I mean about relationships? I’m a perfect example. A few months ago, I had figured out how to live my life on my terms: hockey, school, surfing, the casual hook up with the next consenting hot girl to come my way. Now I’m a f…ed up mess trying to figure out what I’m feeling for Trace. She deserves more than this guarded, emotional wreck. After having to decide whether or not Tracey could continue with her education, she decides that moving schools is the way to go. She is also an amazing ice skater and is able to join the club team of her new school. Since ice time is hard to come by, the skating team will also run into the hockey team from time to time. Dak is cocky and arrogant. He is also smart, kind, and full of guilt. He sees something in Tracey and despite his friends loving being single and having puck bunnies over every night, Dak wants something more. When Tracey realizes that she lives right next door to Dak, can she retreat enough to protect her heart? Dak and Tracey have good chemistry. They banter like old friends but can steam up a room just as quickly. I love that they start as acquaintances and learn to trust each other. Each character has pain in their past and when they share that with each other, you get to see their relationship evolve and grow. I loved their story. It was sweet at times and I loved their banter. I can't wait to see if they will show up in the next book or if it will be about Tracey's lovable roommate. I liked this book, the banter between the main characters and the way both characters have faced their inner demons and survived. Tracey is on a new campus, having decided to transfer schools to finish her graduate studies after being betrayed by her last boyfriend. Her ex did a number not only on her self-confidence but with her self-worth. Tracey doubts her abilities to judge a man's character believing that she only attracts gay men, after all with what happened with her last boyfriend seems to have cemented that fact in her soul. Dak is hiding from his own demons. After a tragic accident with his girlfriend during his freshman year, he's sworn off serious relationships. One-night stands, hook-ups with like-minded women is his norm, until he meets Tracey. He senses from the beginning that she's different, which makes him all the more determined to stay away from her. When they are paired up as lab partners for a class, they begin to really get to know one another, eventually sharing their secrets and pain. Love is not for the faint of heart and they each must overcome the obstacles thrown in their path before living their happily ever after. Both Tracey and Dak are flawed characters who learn from their past and learn to trust and love again. 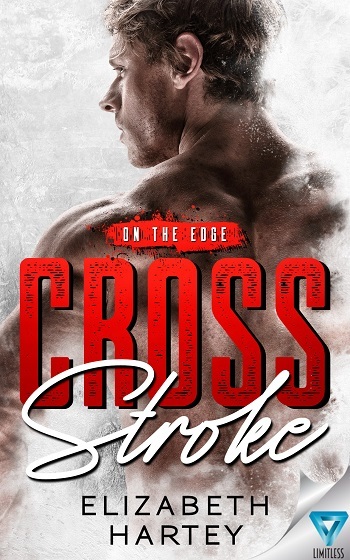 Reviewers on the Wicked Reads Review Team were provided a free copy of Cross Stroke (On the Edge #1) by Elizabeth Hartey to read and review for this tour.